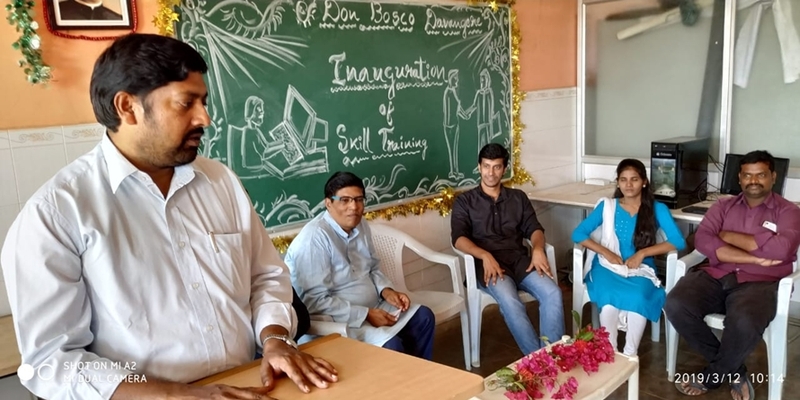 The First Batch of Skill Training at Don Bosco Child Labour Mission, Davangere under the patronage of BREADS was inaugurated on 12th March by Rev. Frs. Cyril Sagayaraj, Rector, Jose Joseph the Administrator and Aloysius Santiago sdb. The batch consists of 30 students both boys (6) and girls (24), the course covers Basic Computer training skills with tally, Excel etc, along with Spoken English classes and Skill training (Syllabus prescribed by DBTECH). The inauguration ceremony began with a prayer song by Ms. Shruthi, Ms. Manja Naik, co-coordinator MCB welcomed the gathering. Fr. Cyril Sagayaraj in his presidential address thanked Fr. Joy BREADS for his initiative and for making it possible so that the youngsters in Davangere are trained and are placed for jobs so to make up a livelihood for themselves, he called on the students to make use of this opportunity to learn and to get settled in life, he also urged them to tell their friends about this facility so that more and more youngsters can avail this opportunity. Fr. Aloysius in his inaugural speech spoke on motivation and said how motivation was crucial to succeed in life and to stand tall in society. Ms. Hasina a student being a Muslim said that there were many centres run by Muslims which is meant only for them but whereas we need to be happy and proud of Don Bosco because Don Bosco embraces all and has brought us all together under one umbrella without any discrimination based on gender, caste, colour, creed or language. Let’s make use of this opportunity to learn and thus be empowered. Mr. Chetan D'Souza Coordinator of Skill Training introduced the teachers and Mr. Thomas student proposed the vote of thanks.